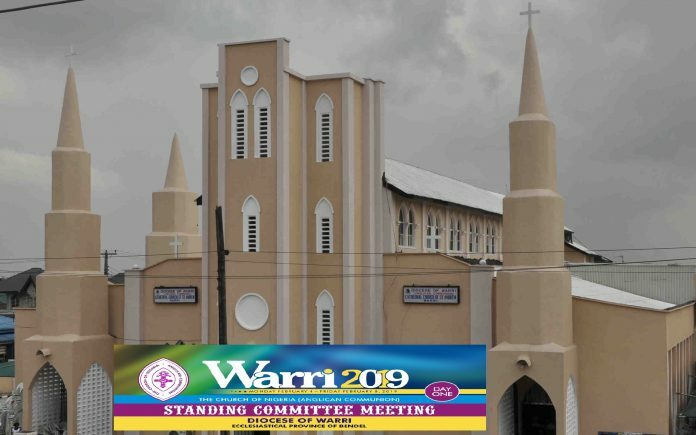 A unique gathering and event started yesterday at the St. Andrew’s Anglican Cathedral of Warri in Delta State. It is the Standing Committee Meeting of the Anglican Communion of the Church of Nigeria under the distinguished leadership of the Primate Metropolitan of Nigeria – His Grace, the Most Reverend Nicholas D. Okoh. Delegates are expected from all the 14 Provinces and 164 Dioceses and other institutions of the Anglican Communion across Nigeria. Not less than 14 Archbishops and 167 Bishops are expected at this epoch making Standing Committee Meeting. Members, clergy and laity alike were seen as early as 9.00am gaily dressed working tirelessly to set the stage or venue for the hosting of the event at the St. Andrew’s Anglican Cathedral. Dedicated and assigned worshippers who thronged the venue were seen arranging and decorating the church, canopies and the premises. Caterers were doing their chores; the Boys Brigade and Girls Guild movements were on ground to order movement and women dance troupe apparently organized by the Organizing Committee in conjunction with the Women Organization led by Mama Warri – Mrs. Patience Ide were beautifully dressed in orange wrapper and white blouse with specially beaded necks. All these were to ensure a rousing reception for the Primate Metropolitan and visiting clergy/delegates from across the nation. Arrival of guests and registration scheduled for 2:00pm had arrivals as early as 1:00pm. The Standing Committee represents the Anglican Communion of the Church of Nigeria in general. The body is made up of all the Archbishops and Bishops of the Anglican Church including the Convocation of Anglican Churches in North America. At the head of all the 14 Archbishops and 167 Bishops is the Primate of Nigeria – Anglican Communion, the Most Reverend Nicholas D. Okoh. This committee stands in to deliberate over matters of church leadership/ management in relation to existing challenges internally and externally. They represent the general synod on issues that are urgent and cannot wait for the general synod body which holds once in three (3) years. The Standing Committee therefore is an abridged synod and meets twice every year. This edition is being hosted by the Province of Bendel under the Archbishop Most Revd. Friday John Imaekhai and particularly Warri Diocese under the Bishop Rt. Revd. Christian Esezi Ide. The theme of this all important meeting is “THE LORD IS MY SHEPHERD” taken from Psalm 23:1. The event promises to deliberate over thorny issues of Anglican faithfuls and the challenging national environment. It will include Prayer sessions, Bible studies, Worship/Services with inspiring messages, group discussions, Addresses, meetings between the Primate and House of Bishops; House of Clergy, House of Laity and Wives of Bishops. This edition that spans from Monday the 4th February, 2019 Promises lots of divine presence and hope for all faithfuls and the nation at large. Going by the parade of array of exalted men of God, we could easily conclude that God has come to dwell with us in Warri and indeed Delta State. God bless Anglican Communion, God bless Warri Diocese, God bless Delta State; God bless Bendel Province, God bless Nigeria. Next articleARRIVAL OF THE NO. 1 ANGLICAN.